Around 22% of Indian Aluminum conductor market. The above information is shared by company itself on its website. It is headquartered in Mumbai, India with production facilities spread across Rabale(Maharashtra) , Silvassa and Athola (Dadra Nagar Haveli), Khatalwad and Umbergaon (Gujarat). The company has grown to 850 dollar conglomerate as of now. Over the years company has successfully ventured into new areas and has kept its growth in tact during the period and transition. 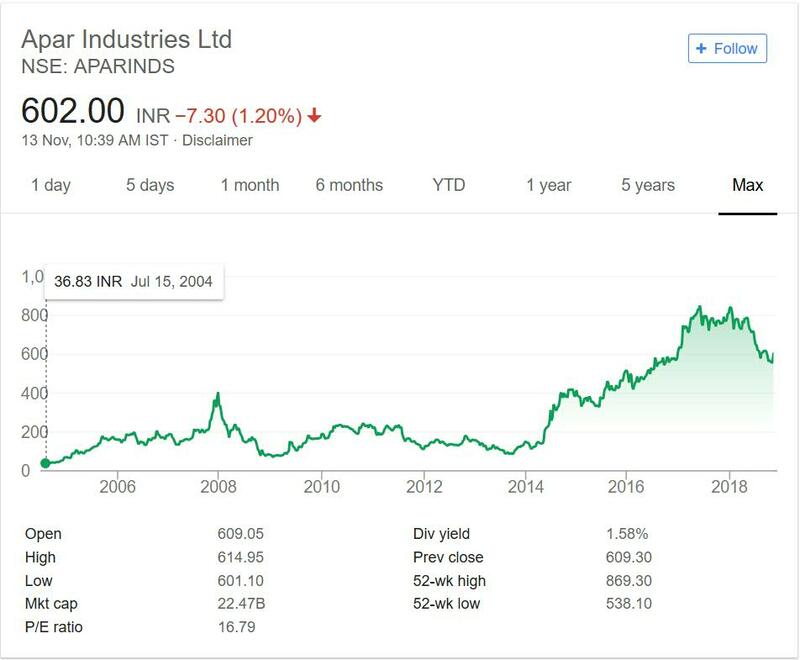 Below I will share Apar Industries Stock performance from IPO days of year 2004. It will give a clear view of company performance over the years and whether it has made money for investors or not. If the company has not performed on Stock Exchanges then there is no point in investing in such company. In year 2004 the stock was trading at 37 mark. In next four years the company has grown from 37 marks to 400 marks. During 2008 crisis the prices nosedived. It was not able to recover from that and it took around 7 years period to reach that mark again. This was consolidation and under performance it never touched above 200 marks. But after that period it broke that 400 mark and then went ahead to 800 mark doubling the investor wealth in short span of time. The dividend yield at current price is also very good (more than 1.5%). So investors made money with price increase as well as consistent healthy dividend over the years. This types of company are great for long term investment as they provide regular income. Apar Industries is in portfolio of ace investor Vijay Kedia. The company has grown over the years. It is also reflected in stock price movement of the company. Note the field of operation was diversified by the company during this time frame. It has major market share in transformer oil. With recent Rural electrification drive from Government of India this segment of company will see good growth. Other verticals of the company are also poised for growth. Note the company serves various industries mainly with some products and some products are consumer focused. For example cables and automotive oil are consumer focused whereas lubricant oil and transformer oil are industry focused. It is also working with Government on high tension conductor manufacturing. So the company has shown growth and maturity in past and is poised to grow in future based on area of operation. It would be an interesting play in the niche. Apar Industry is nice play in the niche. It is expanding the foot prints in different industries. You should compare it with companies in that niche to make sure if there is scope for growth. The future price movement of this company will be defined with growth in other segments. You should add this company in your stock watch list if you are interested so that you can track progress of it over the time.